MAN Diesel’s Turbocharger Business Unit has announced the introduction of a new product to extend its existing TCA range of axial turbochargers. The TCA33 has been specifically designed to meet the needs of the MAN Diesel V28/33D engine, based on two turbochargers being fitted. The project’s first phase is now completed, with prototypes being delivered. 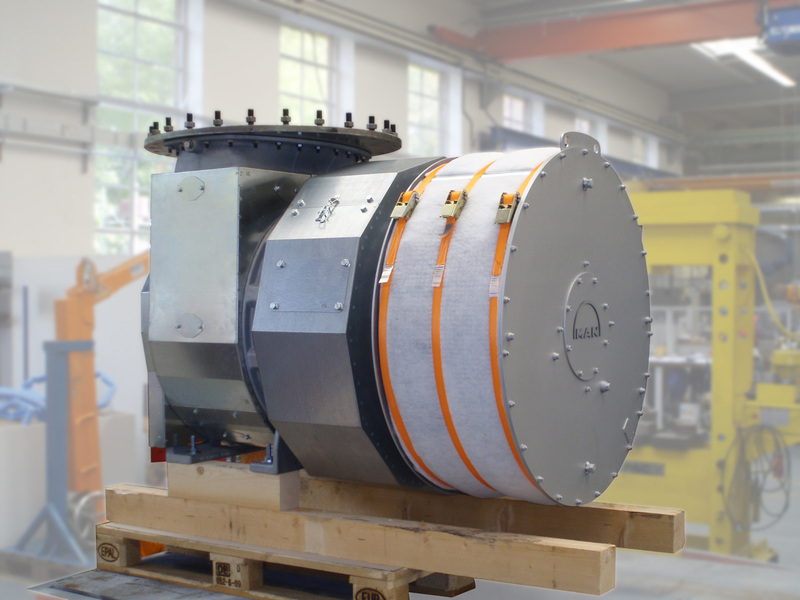 One turbocharger will immediately commence rig testing in Augsburg and two further units will be shipped to the MAN Diesel facility in St. Nazaire, for concurrent on-engine trial. The compressor side of the TCA33 is mainly derived from the TCR series and shares the same shaft fixing arrangement. Specific compressor wheels are applied to deliver the 5.2 pressure ratio requirements necessary for engines to meet IMO Tier II emission limits. MAN Diesel has also introduced new concepts in response to these pressure ratio demands, which are driven by the increased use of Miller timing. As Emanuel Bölt points out, “Even with specific compressor wheel designs, high pressure ratios still result in high air discharge temperatures and increased material temperatures in the compressor wheel itself. Creep life is an important operational factor and use of titanium would introduce unacceptable costs and other technical disadvantages. We therefore decided that an innovative approach was required to limit compressor wheel temperatures and maintain operating lives with aluminium wheels.” The new system developed by MAN Diesel incorporates water cooling in the region of the sealing plate behind the compressor wheel, this having been proven to control temperatures in the compressor wheel backface. The water system itself is integrated with the engine and complexity is therefore minimised. Leakage channels are included in the design to remove any possibility of cross-contamination between air, water and oil systems. The turbine side of the TCA33 has features in common with the other TCA turbochargers but with further consideration being given to close integration with the V28/33 engine. The angled turbine inlet casings are designed to match the engine exhaust, both in terms of physical interfaces and gas flow optimization. Each turbocharger uses the same inlet casing, which is simply re-phased to the opposite angle. The turbine outlet casing is also of new design, resulting from the requirement for the engine package to fit compact ship engine rooms. The solution was to adjust the rectangular profile of the TCA outlet casing, reducing its width, and then provide a direct connection to the round exhaust system. Through detailed analysis and design, this was achieved with very low pressure losses in the connection itself and in the downstream exhaust duct. To allow flexibility of installation, the gas outlet casing can be indexed by 15 degree angle increments. The compressor casing can be adjusted to any angle. Bearings are common with the latest developments of the TCA. MAN Diesel supplies its own air filter silencers and a variety of different air inlet casings are available for the TCA33, optimised for flow capacity and noise levels whilst still designed for compact installation. MAN Diesel sees the TCA33 as a leading example of the benefits of integrated design, where the requirements of the engine, the installations and the turbocharger have been considered in total. The priority is now to achieve comprehensive validation of the turbocharger, both in the test rig and on the laboratory engine, prior to field testing on the V28/33D and, ultimately, production release.